Background: QVA149 is a dual bronchodilator combining the long-acting β2-agonist(LABA) indacaterol and the long-acting muscarinic antagonist (LAMA) glycopyrronium, for maintenance treatment of COPD. 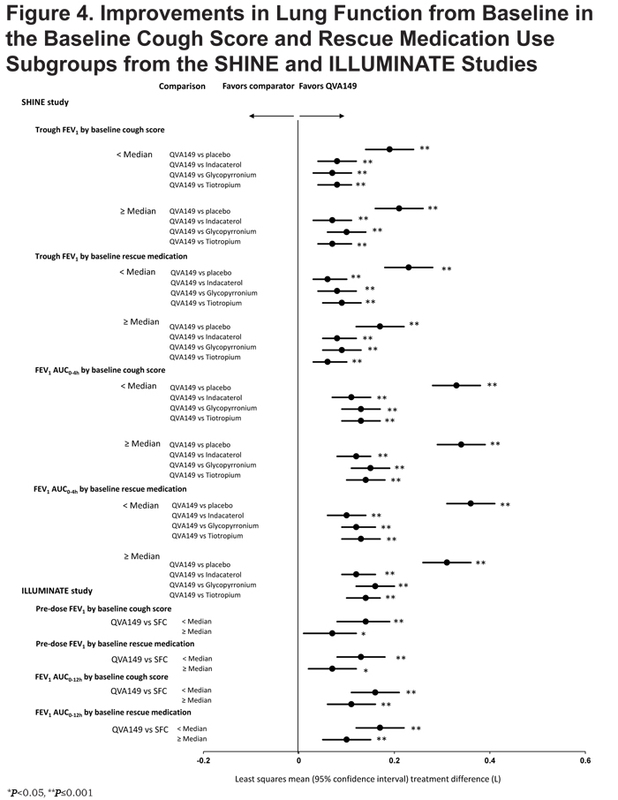 This post hoc analysis evaluated the improvements in lung function, dyspnea, and health status in subgroups of patients based on prior medication use, disease severities, baseline cough score, and baseline rescue medication use, achieved with QVA149 compared with placebo and other active comparators in 2 phase III clinical studies. Methods: In both the SHINE (NCT01202188) and ILLUMINATE (NCT01315249) studies, symptomatic patients aged ≥40 years with moderate-to-severe COPD were randomized to once-daily QVA149 (110/50 µg), indacaterol (150 µg), glycopyrronium (50 µg), tiotropium (18 μg), or placebo (2:2:2:2:1) and once-daily QVA149 (110/50 µg) or twice-daily salmeterol/fluticasone ([SFC]; 50/500 µg), respectively for 26 weeks. Here, we present the improvements in lung function, transition dyspnea index (TDI) and St. George’s Respiratory Questionnaire (SGRQ) total score by prior medication use and COPD disease severity separately from both studies. Results: In total, 2144 and 523 patients were randomized in the SHINE and ILLUMINATE studies; 89.1% and 82.6%, respectively, completed the study. QVA149 showed significant improvements in lung function compared with placebo (SHINE study) and SFC (ILLUMINATE study) regardless of prior medication, disease severity, baseline cough score, and rescue medication use. TDI and SGRQ total scores were also improved with QVA149 compared with placebo and SFC in most of the analyzed subgroups. Conclusion: QVA149 showed improvements in lung function, dyspnea, and health status in both moderate and severe COPD patients independent of previous medication use and baseline cough score. Funding support: These studies were funded by Novartis Pharma A.G. SHINE and ILLUMINATE are 2 of the pivotal clinical trials for the Indacaterol and GlycopyrroNium bromide clInical sTudiEs (IGNITE) registration program13 of QVA149. SHINE was a multicenter, randomized, double-blind, parallel-group, placebo- and active-controlled 26-week study. The SHINE study compared the efficacy and safety of QVA149 to that of its monocomponents (indacaterol and glycopyrronium) and OL tiotropium. ILLUMINATE was a 26-week, multicenter, double-blind, double-dummy, parallel-group study comparing the efficacy and safety of once-daily QVA149 and twice-daily SFC. This post hoc analysis was performed on data from the SHINE and ILLUMINATE studies, separately to evaluate the improvements in lung function, dyspnea, and health status in different subgroups of patients based on prior medications, disease severities (moderate or severe), baseline cough score, and baseline rescue medication use, with QVA149 compared with placebo and other active comparators of both the studies. Patients with COPD are heterogenous and this is reflected in the range of therapy they receive, their disease severity as reflected by lung function and their symptom burden. The objective of this analysis was to explore the additional benefits of the LABA/LAMA dual bronchodilator, QVA149, compared with placebo, single bronchodilators and LABA/ inhaled corticosteroids (ICS), in patients with moderate to severe COPD based on both prior medications, as well as on measures of clinical disease characteristics. Such an analysis might identify subgroups that could particularly benefit from dual bronchodilation, which might then be explored more fully in future studies. Both SHINE and ILLUMINATE were multicenter, randomized, double-blind, parallel-group, 26-week studies. The study details and primary outcomes have been published previously.9-10 Both studies were approved by international and local ethics review boards and were conducted in accordance with the Declaration of Helsinki and Good Clinical Practice guidelines. All patients provided written, informed consent. Both the SHINE and ILLUMINATE studies included symptomatic patients (males and females), aged ≥40 years, with moderate to severe COPD and a smoking history of ≥10 pack years. In the SHINE study, symptomatic patients with a post-bronchodilator forced expiratory volume in 1 second (FEV1) of ≥30% and <80% of predicted normal and post-bronchodilator FEV1/forced vital capacity (FVC) <0.70 were included. Symptomatic patients with a post-bronchodilator FEV1 between 40% to 80% of predicted value and post-bronchodilator FEV1/FVC <0.70, and without a history of moderate to severe COPD exacerbation within the last year were included in the ILLUMINATE study. Further details of inclusion and exclusion criteria from both the studies are provided in the online supplement (appendix e-Table 1). 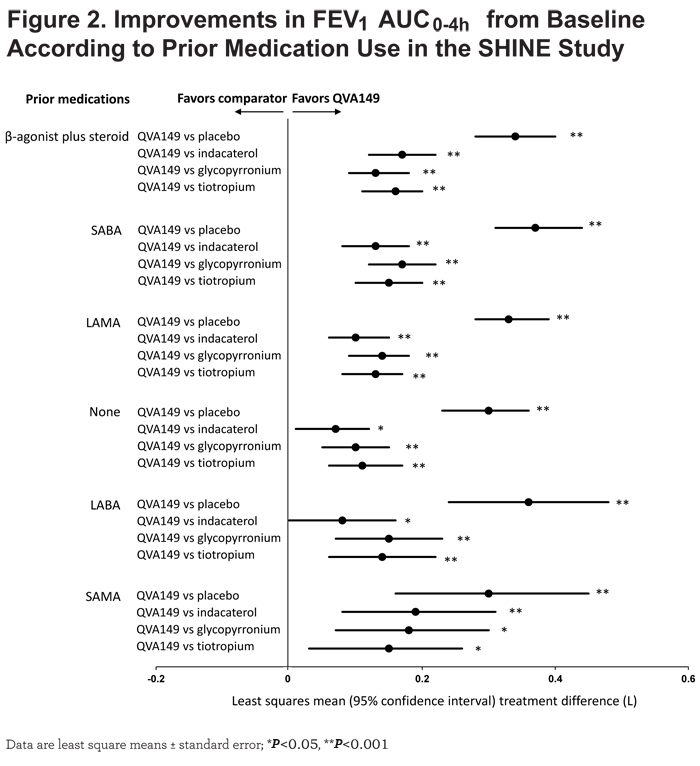 For the present post hoc analysis, patients from the SHINE study were grouped based on prior medications. At the time of screening, patients were using different medications either alone or in combination. However, in some instances there were relatively few patients by category. Therefore, in order to avoid these small numbers, patients were grouped into 6 categories (β-agonist + inhaled corticosteroids [LABA/ICS], short-acting β-agonist [SABA], long-acting muscarinic antagonist [LAMA], none, long-acting β2-agonist [LABA] and short-acting muscarinic antagonist [SAMA]). The details of prior COPD medications were collected during the pre-screening period based on predetermined drug categories on the case report form. A patient could be allocated into more than 1category. Patients with prior medications, as collected from the case report form, underwent extensive washout of the drug during the washout period of the study (with the exception of allowed SABA as rescue medication). For both SHINE and ILLUMINATE studies, disease severity subgroups were based on the severity of disease as per Global initiative for chronic Obstructive Lung Disease (GOLD) 20092 (moderate and severe). Patients were considered to have moderate COPD if % predicted FEV1 was 50% to 80% and severe COPD if % predicted FEV1 was 30% to <50%. Subgroups were also made based on baseline cough score as <median and ≥median for these 2 studies. A baseline cough score of less than the median of 1.13 (on a scale of 0 to 4) approximately represented no cough or mild cough in the 14-day run-in period and patients with a baseline median cough score of ≥1.13 had moderate or severe cough in the 14-day run-in period. Similarly, patients were also subgrouped based on rescue medication use in the run-in period as <median (less than, on average, 3.1 puffs per day) and ≥median (more than, on average, 3.1 puffs per day). In the SHINE study, improvement in lung function was assessed via trough FEV1 (defined as the mean of FEV1 at 23 hours 15 min and 23 hours 45 min postdose) and standardized area under the curve from 0 to 4 hours (AUC0-4h) for FEV1 after 26 weeks treatment. In the ILLUMINATE study it was assessed via predose FEV1 (defined as the mean of the -45 min and -15 min FEV1 values prior to study dose) and FEV1 AUC0-12h. Dyspnea and health status in all the subgroups were also assessed using transition dyspnea index (TDI) and St George’s Respiratory Questionnaire (SGRQ) scores, respectively. Randomized patients who received at least 1 dose of the study drug were included in the analysis. The subgroup analyses with respect to COPD severity for trough FEV1, FEV1 AUC5min-4h, TDI focal score, and SGRQ total score were performed using a mixed model including treatment, baseline smoking status (current/ex-smoker), baseline ICS use (yes/no), COPD disease severity, treatment by COPD disease severity interaction, and region as fixed effects with center nested within region as a random effect. The subgroup analysis with respect to baseline cough score and rescue medication use during run-in period were analyzed in a similar way with associated subgroup variables. The model also contained baseline measurement and reversibility components as covariates. Least squares means (LSM) of treatment difference between QVA149 and active treatment group and the placebo were presented with either its standard error or 95% confidence interval (CI) and P value. The same efficacy end points were analyzed within each respective category of prior COPD medication. The model contained similar terms as described above without the subgroup variable and the associated interaction term with treatment. In total, 2144 and 523 patients were randomized in the SHINE and ILLUMINATE studies; 89.1% and 82.6%, respectively, completed the study. Patient demographics of different subgroups are shown in Table 1. The most common prior medications used were β-agonist + steroids (37.9%) followed by SABA (36.5%) and LAMA (29.3%) prior to enrollment into the SHINE study while, 23.5% of patients were not using any medications. The percentage of patients in the LABA (12.3%) and SAMA (6.5%) prior medication subgroups were comparatively small. 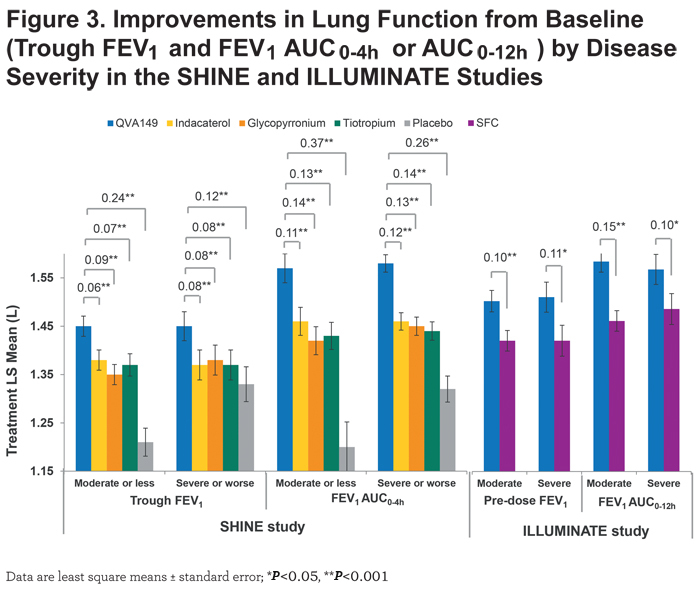 In the SHINE study, QVA149 significantly improved lung function (trough FEV1 and FEV1 AUC0-4h) in all the subgroups based on prior medication (Figures 1 and 2), disease severity (Figure 3), baseline cough score, and baseline rescue medication use (Figure 4) compared with placebo. For trough FEV1, the results were fairly consistent across subgroups, however, the greatest improvement was seen in those patients with prior LABA therapy (LSM treatment difference 250 mL; P<0.001), whereas for FEV1 AUC0-4h, the largest improvement was observed in those with prior SABA use (LSM treatment difference 370 mL; P<0.001). Compared with active comparators, QVA149 achieved statistical significance in most subgroups for improvement in trough FEV1. For the few subgroups where statistical significance was not achieved, QVA149 always demonstrated numerically greater improvement (Figure 1). Finally, QVA149 achieved statistically significant improvements in FEV1 AUC0-4h in all subgroups compared with all other active comparators of the SHINE study. For disease severity subgroups, QVA149 significantly improved trough FEV1 and FEV1 AUC0-4h in patients with both moderate and severe COPD compared with placebo and other active treatments in the SHINE study (Figure 3). Although the difference from placebo in both trough FEV1 and FEV1 AUC0-4h was greater in patients with moderate COPD, the differences between QVA149 and the active comparators were generally similar. In the ILLUMINATE study, predose FEV1 and FEV1 AUC0-12h were significantly improved in all the analyzed subgroups (disease severity, baseline cough score, and rescue medication use) with QVA149 compared with SFC after 26 weeks treatment (Figures 3 and 4). Overall, in terms of improvement in lung function the mono-components of QVA149, indacaterol and glycopyrronium, were roughly equally effective to tiotropium (in the SHINE study), while the LABA/LAMA fixed-dose combination, QVA149, proved to be superior to tiotropium (in the SHINE study) and SFC (in the ILLUMINATE study). 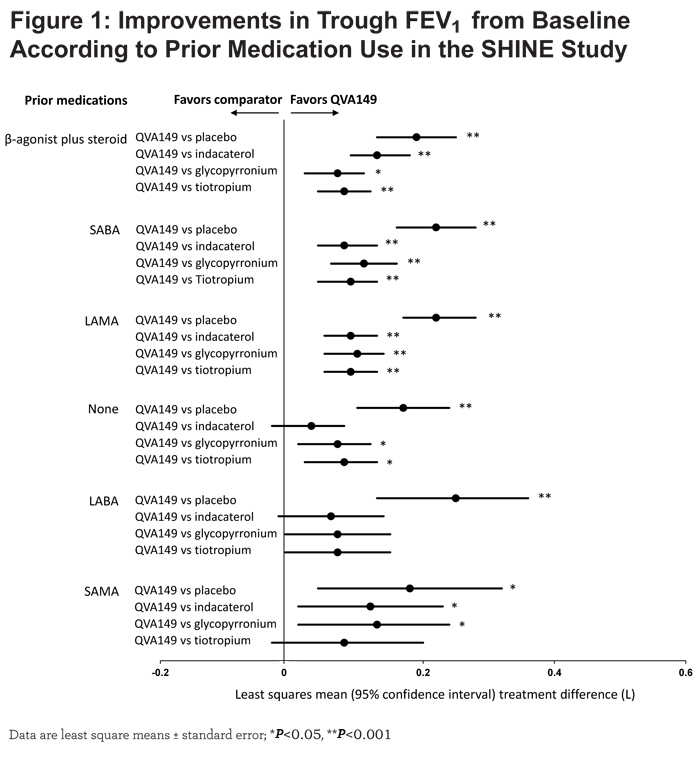 Significant improvement in TDI total score was observed in the QVA149 group compared with placebo with a treatment difference ranging from 2.27 to 0.71 in all the prior medication subgroups of the SHINE study (Table 2) except in the LABA prior medication subgroup. QVA149 also showed a significant improvement in TDI total score versus tiotropium in the LAMA (LSM treatment difference 0.91; P<0.05) and SABA (LSM treatment difference 0.67; P<0.05) subgroups. 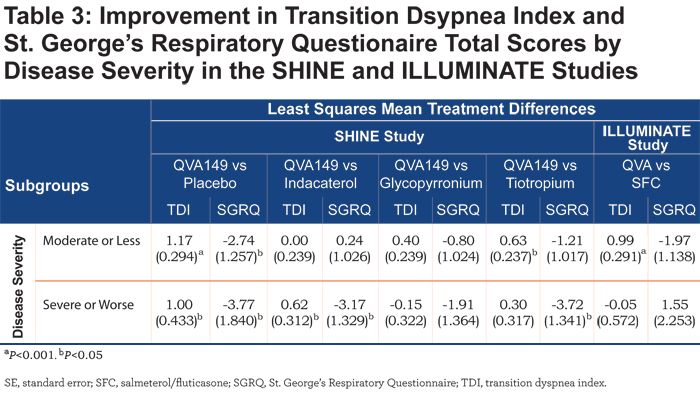 In addition, QVA149 showed a significant improvement in TDI total score compared with placebo irrespective of disease severity in the SHINE study and also compared with SFC in patients with moderate COPD (LSM treatment difference 0.99; P<0.001) in the ILLUMINATE study (Table 3). No such improvement in TDI total score between QVA149 and SFC was observed in patients with severe COPD in the ILLUMINATE study. 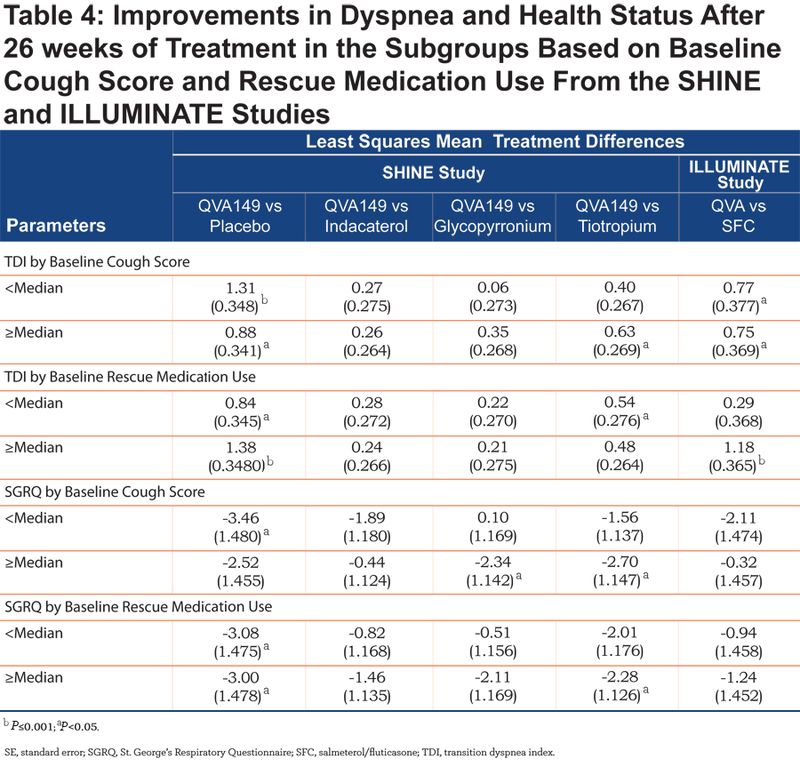 TDI total score was also statistically significantly improved with QVA149 compared with placebo in all the subgroups based on baseline cough score and the rescue medication use (Table 4) in the SHINE study. QVA149 showed a statistically significant improvement in TDI total score compared with tiotropium in the subgroup of patients with ≥median baseline cough score (LSM treatment difference 0.63; P<0.05) and < median baseline rescue medication use (LSM treatment difference 0.54; P<0.05). In the ILLUMINATE study, statistically significant improvement in TDI total score was achieved with QVA149 compared with SFC in both the subgroups based on baseline cough score and in the subgroup of patients taking ≥ median baseline rescue medication. 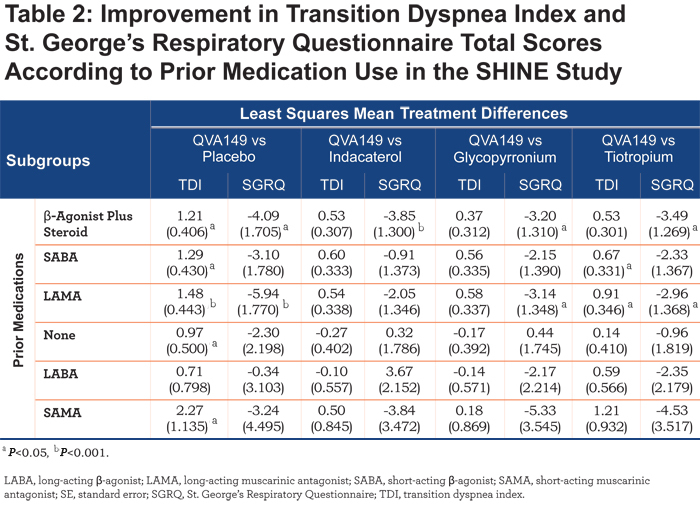 SGRQ total score was improved with QVA149 compared with placebo in the SHINE study in different subgroups based on prior medication, disease severity, baseline cough score, and baseline rescue medication use (Tables 2, 3, and 4). 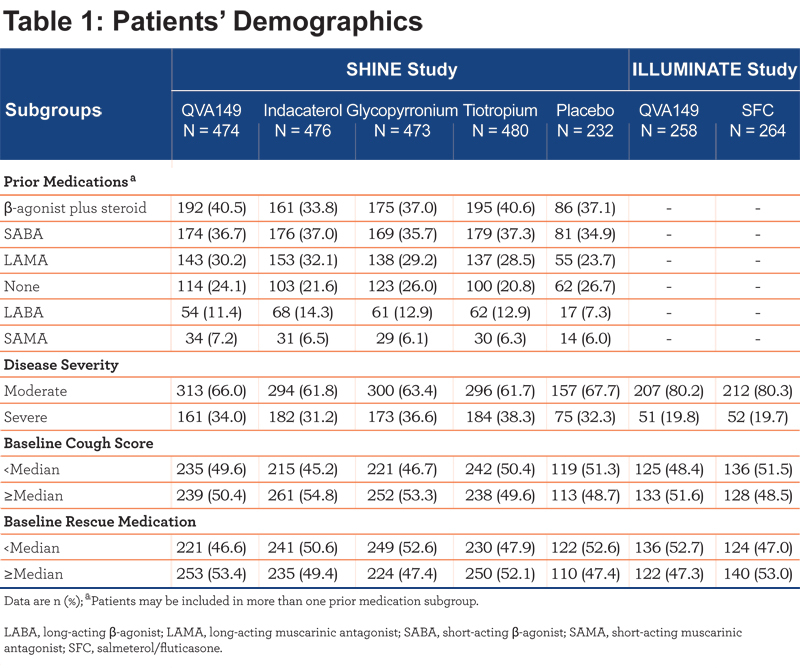 In general, the effects on SGRQ with QVA149, compared with the comparators in the SHINE study, were numerically greater in the patients with severe COPD compared with those with moderate disease (Table 3). In the ILLUMINATE study, QVA149 improved SGRQ total scores compared with SFC in patients with moderate COPD (LSM treatment difference -1.97) and in other subgroups based on baseline cough score and rescue medication use (Tables 3 and 4). This post hoc analysis was conducted to confirm the efficacy of the LABA/LAMA dual bronchodilator, QVA149, in different categories of patients based on their prior medications, disease severity, baseline cough score, and rescue medication use in the SHINE and ILLUMINATE studies. In all the subgroups analyzed, QVA149 significantly improved lung function compared with placebo (SHINE study) and SFC (ILLUMINATE study). It also improved dyspnea and health status in most of the subgroups. The findings of this analysis were in concordance with the primary and secondary outcomes of the SHINE9 and ILLUMINATE10 studies. At the time of enrollment in the SHINE study, 76.5% of patients were on maintenance treatment with different classes of COPD medication, whereas 23.5% were maintenance naïve. QVA149 improved lung function in all the subgroups irrespective of prior medications in the SHINE study. In both the SHINE9 and ILLUMINATE10 studies, QVA149 also significantly improved lung function in patients who were using ICS at baseline. However, it should be noted that although ICS is recommended only for COPD patients in GOLD groups C and D,2 57.5% and 35.1% of patients in the SHINE and ILLUMINATE studies, respectively, which were comprised predominantly of Group B patients, were receiving ICS prior to study enrollment. Thus, many of the patients in the SHINE and ILLUMINATE studies did not meet the criteria recommended for ICS use as per the current GOLD strategy. The efficacy of QVA149 as measured by the improvement in lung function, however, was not influenced by prior ICS use in either of these studies. Improvements in lung function were generally larger in patients with moderate COPD than patients with severe COPD. However, there was a larger placebo response in the severe COPD subgroup which may have led to apparent greater improvements in the moderate COPD patients. In earlier studies, both mono-components of QVA149, indacaterol14 and glycopyrronium,15 showed similar results in the subgroup analysis of patients based on disease severity. This effect has been shown with other bronchodilators as well.16,17 In this post hoc analysis, dual bronchodilation with QVA149 significantly improved lung function in patients with both moderate and severe COPD compared with single bronchodilator therapy. QVA149 also improved dyspnea and health status compared with placebo in most of the subgroups of patients in the SHINE study. In this post hoc analysis, improvements in TDI and SGRQ total scores were not always statistically significant; however, this may be due to small numbers of patients in some subgroups. In addition, neither TDI nor SGRQ total scores were the primary end point in the included studies, which were not powered to detect significant differences in TDI and SGRQ total scores between QVA149 and comparators. Interestingly, the numeric improvements in the SGRQ total score with QVA149 compared with either placebo or the active comparators in the SHINE study were greater in the severe patients, but this difference was not seen compared with SFC in the ILLUMINATE study. This may reflect a greater benefit of ICS in patients with more severe COPD. In this post-hoc analysis, improvement in TDI total score was more sensitive in moderate COPD patients whereas, improvement in SGRQ total score was more sensitive in severe COPD patients when comparing the results of dual versus single bronchodilator therapy in the SHINE study. If confirmed in further studies, this could be an important insight so that SGRQ might be a preferred instrument to discriminate between therapies in patients with severe COPD, whereas TDI might be preferred for this role in patients with moderate COPD. One of the limitations of this analysis is that several of the subgroups were small and the analysis was post hoc. They do not rule out the possibility that there are specific phenotypes of COPD patients that might respond better than average to dual bronchodilation. As well, the primary studies of this analysis were 6 months in duration, a short time period over which to evaluate some outcomes such as exacerbations. Nonetheless, it is reassuring that most of the categories and groups of patients studied were benefited by this treatment. This finding supports the general recommendation that the combination of LABA and LAMA may be an alternative choice for prescribers so that patients in GOLD groups B, C, or D could leverage the full benefit of such a combination. The authors were assisted in the preparation of the manuscript by Santanu Sannigrahi and Kevin Roche (Novartis). Writing support was funded by the study sponsor, Novartis. Employees of the sponsor (HC, HH, RF and DB) were involved in the conception and design of the studies, acquisition of data and analysis and interpretation of data, and developed the manuscript. KRC, in the last 3 years, has received compensation for consulting with Almirall, Boehringer Ingelheim, CSL Behring, GlaxoSmithKline, Merck Frosst, Novartis, Takeda, Pfizer, Roche, Schering Plough and Grifols; has undertaken research funded by AstraZeneca, Boehringer Ingelheim, CSL Behring, Forest Labs, GlaxoSmithKline, Novartis, Roche, Takeda and Grifols; and has participated in continuing medical education activities sponsored in whole or in part by AstraZeneca, Boehringer Ingelheim, GlaxoSmithKline, Grifols, Merck Frosst, Novartis, Takeda and Pfizer. He is participating in research funded by the Canadian Institutes of Health Research operating grant entitled Canadian Cohort Obstructive Lung Disease (CanCOLD). He holds the GSK-CIHR Research Chair in Respiratory Health Care Delivery at the University Health Network, Toronto, Canada. EDB has served as a consultant to AlkAbello, Almirall, Cephalon, Hoffman la Roche, ICON and MS Consulting Group; been on advisory boards for Almirall, AstraZeneca, Boehringer Ingelheim, Elevation Pharma, Forest, GlaxoSmithKline, Merck, Napp, Novartis and Nycomed; and received lecture fees from AlkAbello, AstraZeneca, Boehringer Ingelheim, Chiesi, GlaxoSmithKline, Novartis, Pfizer and Takeda; and his institution has received remuneration for participation in clinical trials sponsored by Actelion, Aeras, Almirall, AstraZeneca, Boehringer Ingelheim, Forest, GlaxoSmithKline, Hoffman La Roche, Merck, Novartis, Takeda and TEVA. HC,HH, RF and DB are employees of Novartis and have no other conflicts of interest. 2. Global Initiative for Chronic Obstructive Lung Disease (GOLD). Global strategy for the diagnosis, management and prevention of chronic obstructive pulmonary disease, 2014. http://www.goldcopd.com.Updated January 2014. Accessed February 18, 2014. 10. Vogelmeier CF, Bateman ED, Pallante J, et al. Efficacy and safety of once-daily QVA149 compared with twice-daily salmeterol-fluticasone in patients with chronic obstructive pulmonary disease (ILLUMINATE): a randomised, double-blind, parallel group study. The Lancet Respir Med. 2013; 1(1):50-60. 13. Price D, Mezzi K, Fedele MJ, Chen H, Banerji D. P235 Dual-bronchodilation with once-daily QVA149 in patients with moderate-to-severe COPD: overview of the IGNITE program. Thorax. 2013; 68(Suppl 3): A183-A184. 15. D'Urzo AD, Hebert J, Overend T, et al. Glycopyrronium once daily provides sustained bronchodilation and improves symptoms in various subgroups of patients with COPD. Am J Crit Care Respir Med. 2013; 187:A4261.